We no longer provide this service and the software is for sale. Technology Development Co. Provides breakup forecasts for sites in the Beaufort, Chukchi and Bering Sea. Breakup Forecasts are created about April 5th for the following summer. The graphs above show hindcasts for the period 1973 to 2014 for Barrow and the Bering Strait. Most sites along the Chukchi and Beaufort Seas have been analyzed and forecasts can be made available. The two Arctic Ocean seas that adjoin the Alaska coast are the Beaufort and Chukchi, and both are completely covered by ice most of the year. The third Alaska Sea with substantial ice cover is the Bering Sea, where ice covers about the northern third of the sea at its maximum extent. These three seas are important transportation corridors for Alaska, Northwest Canada and the Russian Far East. Most of Alaska is without roads or rail and the only means for shipping heavy equipment and supplies to Alaska’s coastal villages, as well as shipping large modules to the oil fields on Alaska’s northern coast, is by sea. Even villages and towns inland along the major rivers receive supplies from the sea via barges. These seas are also important feeding grounds for whales and walrus that migrate into the Beaufort Sea during the short summer. The Bering Sea is one of the most productive fisheries in the world and millions of tons of cod, pollock, halibut, and crab are harvested each year along with millions of Salmon returning to rivers and streams along the coast. Thus, Alaska’s arctic seas are essential for the economic health of the state and its residents. The primary factor limiting marine transportation in these areas is the presence of various types of sea-ice for most of the year. Ice begins to form in September or early October and by November all shipping to coastal villages ceases until the following summer. Many people think the arctic ice pack is a flat expanse of stationary ice. Nothing could be further from the truth. If you have seen scenes of a city after a major earthquake, with large mounds of rubble everywhere, you can imagine what the ice pack looks like; hills of broken ice rubble, flat plates of new and thin ice, and leads of open water are some of the features of the ice-pack. The sliding plates of continents create the forces that build mountain chains and similar forces shape the features of the ice pack. Sliding plates of sea-ice are forced upon other plates, they break and upend and more ice is forced on top of that. Polynya and leads are created by the wind, promptly freeze, and then are crushed in turn. It is rugged terrain that is so broken up that it is difficult to walk in a straight line for any distance. The arctic ice pack in an active zone can be an awe-inspiring spectacle as ice floes clash, split into fragments, and override each other. Standing on one floe while another one the size of a football field moves past at the speed of an escalator is something long remembered. It is not only the motion that is impressive; when plates of ice several feet thick pile on top of one another, it is a noisy affair. When the active zone is some distance away, a low rumble can be heard in the distance, like an advancing front of thunderstorms. There are many terms for sea-ice in various stages of growth, but we will mention only a few. Grease ice is one of the first stages of freezing when a few inches of water turn into a thick grayish, watery, icy soup that looks like grease. It undulates with small waves and offers little resistance to moving boats. Subsequent stages of growth are called new ice, young ice, first-year ice, and finally multi-year ice. First-year ice reaches a maximum thickness of about six feet in the long cold winter. Of course the ice does not usually reach this thickness without being distorted by dynamic forces of wind and pressure. 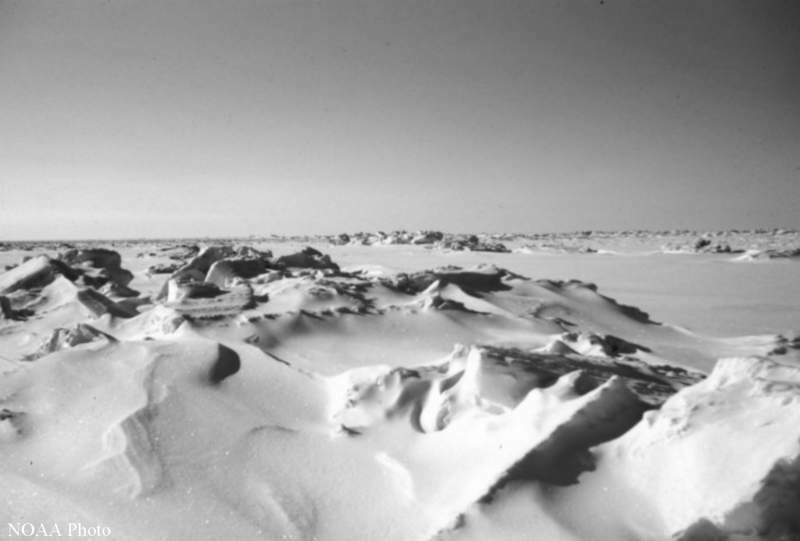 When sea-ice is under pressure, the ice can form into pressure ridges. The underwater portion of these ridges is called the keel and the upper portion the sail. Keels in first-year ice ridges commonly reach 45 feet in depth and can easily reach 150 feet. Ice that is frozen from the salty waters of the Arctic Ocean excludes some of the salt during the process of freezing and the rest leaches out over time. As sea-ice goes through successive stages of melt and freeze and loses its salt, other physical properties change as well. It becomes harder and tougher than first-year ice and presents a more hazardous substance to navigation. Melted ice from old ice floes has a blue cast and can be used for drinking water. The arctic ice pack, located in the open sea, consists of drifting ice undergoing complicated dynamic forces caused by wind and ocean currents: motion in various directions, divergence, convergence, shearing, rafting, and ridging occur continuously. The ice pack includes ice of various ages from new and young ice through various thickness of first-year and multi-year ice. It also has ice islands created by calving glaciers and ice shelves. The Alaska portion of the Beaufort Sea is located on the southern edge of a clockwise circulation of pack ice in the Arctic Ocean known as the Beaufort Gyre. This circulation causes pack ice to be injected from the north into the eastern or Canadian Beaufort. It then turns westward and moves along the Alaska coast and departs by way of the western Beaufort and then turns northward. It takes about five years for the ice to complete a circuit and return to its starting point. This motion is not uniform, nor continuous, but twists and turns, and even reverses, depending on weather conditions. The effects of wind on open-ice, disregarding current, will generally cause ice to move at about three percent of the wind speed. The direction of wind induced ice drift is not directly downwind but rather the ice moves at an angle of about 25 degrees to the right of the wind direction. Ice floes with shallow draft move with wind driven surface currents, but those with deep keels are more affected by sub-surface currents and thus move differently. A vagrant floe with a deep keel is like a child in a parade that is marching to a different drummer, it goes hither and yon in an unpredictable manner. Such vagary makes short term forecasting of ice motion a difficult proposition. Multi-year ice is formed in the center of the gyre and the quantity, until recent years, has been rather stable. Normally new multi-year ice is formed at about the same rate as the amount of old ice being lost as it migrates into warmer waters of adjacent seas or into the north Atlantic. However, in about 1998 the amount of old ice lost far outstripped the amount of old ice being formed. This was caused by changes in atmospheric circulation patterns, which in turn was caused by the strongest El Nino ever recorded. The summer opening of the transportation corridor along Alaska’s northern coast is not a simple thermal process, but a dynamic one influenced by a number of factors, but especially ice conditions in the Beaufort Sea and large-scale meteorological conditions in the months preceding the summer season. Opening of the sea-lane is also influenced by short-term meteorological conditions during the beginning of the summer season when unfavorable conditions (strong onshore winds and low temperatures) can delay the opening and favorable conditions (offshore winds and high temperatures) can speed-up the process, at least to some extent. But mariners beware, what the winds open they can quickly close, at least until the ice has receded far from the coast. In 1897 eight whaling ships with several hundred men aboard were trapped near Barrow by freeze-up and in danger of starving. Three Coast Guardsmen from the ship Bear and a reindeer herder drove 382 reindeer from near Nome to Pt. Barrow, almost certainly saving the whalers from starvation.